As soon as the reading challenges video for this year's BookTube-A-Thon went up I had my TBR (to be read) list planned within minutes! However since wondering into my local library yesterday as it was a PokeStop on Pokemon Go (I LOVE that this game is getting people out and about and exploring their local communities) I found out that they now have a huge young adult section. I've had a change around to include some of the book I've checked out and I am so excited to get to some of these books! If you're not familiar with BookTube-A-Thon, it's a yearly reading marathon which takes place over a week (this year it's July 18th to 24th). There are seven challenges to complete and although it was originally started as a booktube concept you definitely don't need to be a booktuber to take part - there's always a lovely BookTube-A-Thon community on Twitter every year and everyone talks about the books they are reading and supports each other in completing the challenges. It's definitely one of my favourite things about taking part! It's also a great excuse to get a few more books checked off your reading list. After speaking to the lovely Faridah on Twitter recently I realised that I haven't really read any diverse books so when I spotted The Book Is Gay in the library I thought it would be a good one to start with! This is described on the cover as a sequel to Pride and Prejudice so I picked it up immediately as I'm a huge Austen fan! It isn't too long either so I thought I'd be the perfect book for reading at night. 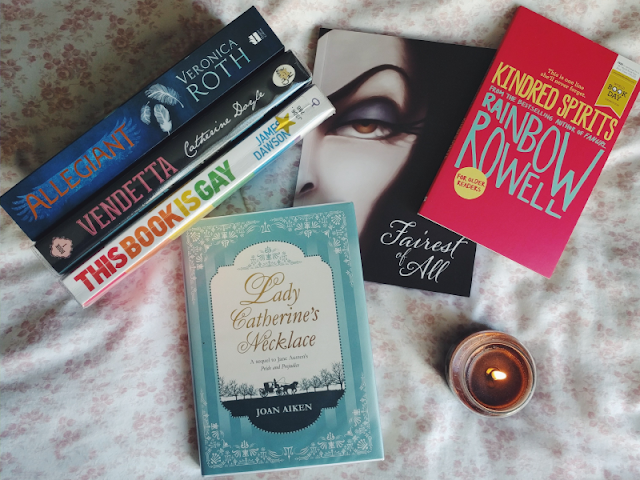 I'm not sure if I discovered this book through booktube or bookstagram but either way I've seen Vendetta being raved about everywhere! I'm really excited to see what all the fuss has been about finally! I've been wanting to read this ever since I bought it but I've been saving it for booktubeathon as it's so small! I've loved everything I've ever read by Rainbow Rowell and this short story is apparently about a Star Wars mega-fan so I can see myself devouring it very quickly! I've been wanting to read this book for years as the Studio Ghibli film that is based on this book is one of my all-time favourite films and when I found that my local library was able to order me a copy I was so happy! It hasn't arrived yet, hence why it's not in the picture above, but as it was first published in 1986 and I was born in 1991, I thought using it for this challenge would be the perfect excuse to get to it as soon as possible. I've been meaning to get this book for a long time, I've read both Divergent and Insurgent and seen their respective films, so I thought I'd finally get this trilogy finished off with this challenge. And finally as I blog about Disney it's only fitting that I include a Disney book! If you want to take part in this year's BookTube-A-Thon as well it's not too late! It starts on Monday and you don't have to read all seven books/complete all seven challenges to take part so you still have time to piece together your own TBR list. Good luck! P.S. If you're taking part make sure you follow the @BookTubeAThon account on Twitter for updates and reading sprints!